Situated in the heart of the Green Villapark in Eindhoven. 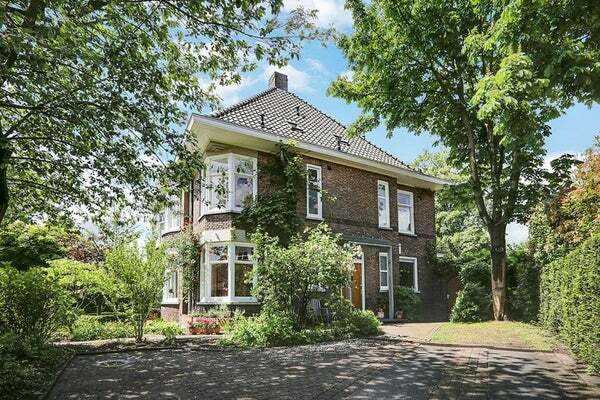 Great family house on prime location, under nice 'jaren '30' architecture. City villa in good condition with i. a.5 bedrooms, 2 bathrooms and extra hobby room. Semi-detached villa with garden on three sides with good sun position. This quiet and child friendly neighbourhood is located close to exit roads and public transport, and opposite to school. Entrance, hall with Belgian hard-stone tiles with floor heating and panelled doors, modern toilet. Large living-dining room with fireplace (gas), nice Afzelia wood parquet floor and high ceiling with traditional ceiling plaster. Beautiful, original round antique bay windows and panelled doors. Roof light in dining area. The double French doors in dining room give access to the terrace and the private rear garden that is also accessible through a wooden gate that can be locked. Kitchen with all built-in appliances and Belgian hard-stone tiles with floor heating, and large L-shaped work top and sink unit. Breakfast corner with convenient Austrian bench. Many cupboards for storage. Automated gated with remote controls, parking lot for three cars and separate gate for bikes. Newly renovated (2017) storage shed in back side of garden. Nicely decorated landing with high ceiling. Completely new bathroom (2017) with rainforest shower, double wash basin and hanging toilet; very large master bedroom (formerly two rooms). Custom made large wardrobes. Large bedroom room with great view on the back garden and large custom made wardrobes. Bedroom with entrance to the rooftop and window to the side of the house. Completely new bathroom with rainforest shower and hanging toilet. Laundry room with connections and drainage for a washing machine and tumble dryer and a separate sink. Infra-red sauna cabin. Two large bedrooms with build-in spotlights. Front room has a large desk. Spacious hobby room/study with large fixed desk; can also be used as a guestroom. Close to i. a. Technical University, High Tech Campus, Hospitals and city center.